Many Detroit residents are celebrating a new era of revitalization, as the city’s thriving Midtown is now dotted with upscale shops, restaurants and new construction. But Motor City, blighted with 83,000 abandoned homes, is also seeing the forced relocation of low-income seniors, most of them African American. “There’s a national trope about Detroit, the idea that it’s empty in a lot of ways,” said Tam E. Perry, a researcher at the Michigan Center for Urban African American Aging Research and assistant professor at Wayne State University, where she heads The Relocation Lab. Phrases like, “Detroit is on the move” have taken hold, she said, promoting the notion that anything can happen there, that you can start a new business, be an artist–see the city as a “blank slate” just waiting for you to make your mark on it. Perry said she became so engaged in her research that she joined the Senior Housing Displacement-Preservation Coalition, a community advocacy group that is working to preserve senior housing, and to ease the transition for those who become displaced. 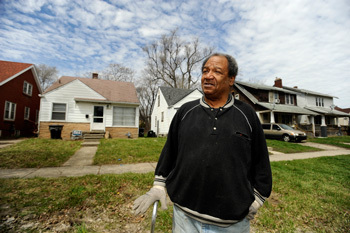 via Detroit Gentrification Means ‘Forced Relocation’ of Black Seniors – New America Media. This entry was posted in News from the Soul Brother and tagged Detroit, gentrification, money, politics, race, senior relocation, seniors, United States. Bookmark the permalink.